There are many things in life that get us down and there are times in our life when life itself can overwhelm so we can lose sight of a way forward. Whatever your issue, let me help you. I specialise in Relationships, Anger, Stress/Anxiety, Addictions, Depression, Self Harm, Eating Disorders, Bereavement, Weight Problems, Illness/Disease, as well as many other issues clients bring to therapy. I will guide you to reach a better understanding of the situation and yourself. By learning new coping mechanisms you will find sloutions that will bring new choices, so you feel you can trust yourself and others again. You may be concerned about your future prospects. I will guide and work with you showing you how to live in the here and now, so the future to become less overwhelming or scary. I have 10 years experience of running my private practise from my home. Counselling adults young and old, children and families. My work takes place in a safe and comfortable allocated room, where confidentiality is given at all times. The type of counselling I use is and intergrative way, working with different types of models. CBT (dealing with thoughts and beleifs), Transactual analysis (looking at behaviours and coping mechanisms), Psychotherapy (looking at childhood experience) I also work with EFT, EMDR and Hypnotherapy. The most appropriate therapy fitting your needs and issue will be always be discussed during your consultation. This ensures you get the most out of your therapy. Successful counselling, comes from a good relationship and rapport between client and counsellor. It is very important to me, that you feel comfortable and know that I will show complete understanding of your issue at the first point of contact. My work is my passion and I am totally devoted, to helping you through any issue, no matter what that may be. You will find me very friendly, patient, a calming influence. I will put you at ease, showing emphathy, support and someone you can trust. I am a registered fully qualified and supervised Counsellor, Hypnotherapist, Reflexology and Reiki Practitioner, and also an accredited registered member of the National Counselling and Hypnotherapy Society. 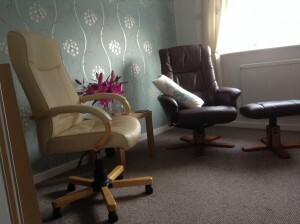 My therapy room is a peaceful haven, for you to feel comfortable to express all that you have held back from expressing before. It is very easy to reach my practise as I am very local to Braintree train station. So all surrounding areas Suffolk, Colchester, Chelmsford, and London are very manageable. Thank you for taking time to read my website page. I hope you found the information very helpful to you. Please feel free to contact me if you have any further information you would like to know, or if you would like to book a consultation. I respond to all enquiries between working with clients, so you will not be left waiting.